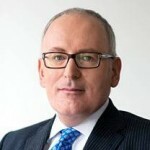 More interestingly for the readers of this blog, Timmermans capitalised on the need for the EU to bring its decision making closer to citizens. Transparency, in his perspective, has a large role to play. Similar to the European Ombudsman, who in a recent report capitalised on the need to better regulate, and render more visible, revolving-door and lobbying practices, Timmermans argued for transparency of legislative decision-making throughout the process. He suggested that such transparency could be reached by instituting impact assessments not only at the beginning, but also at the end of a legislative proposal, and by allowing for greater scrutiny of decision-makers, in particular in the Council of Ministers. However, how he believed such a culture shift could be instigated, or would indeed be received by those involved in the decision making processes remained unclear. Having acted as a representative in the Council, Timmermans is quite familiar with its modus operandi. In 2013 for example, he first had to inform the Dutch parliament that information provision to national parliaments diverged widely in practice. Although he promised to improve the communication of so-called limité documents, access was provided only under conditions of strict confidentiality, meaning that the Parliament could not cite or debate such documents in public. Another difficulty lies within the Commission itself. So far, it is not yet apparent what power Timmermans can wield within the college of commissioners to ensure that his agenda of more efficient and transparent rule-making is carried out. Sophie in ‘t Veld, an MEP from the ALDE group, argued that his agenda relies considerably on the goodwill of his peers. At the same time, Timmermans suggested that his working methods, instead of stern and adversarial would rather be collegial and consensual – but what else could he have answered? This entry was posted on Wednesday, October 8th, 2014 at 11:14 am	and is filed under Practice. You can follow any responses to this entry through the RSS 2.0 feed. Responses are currently closed, but you can trackback from your own site.